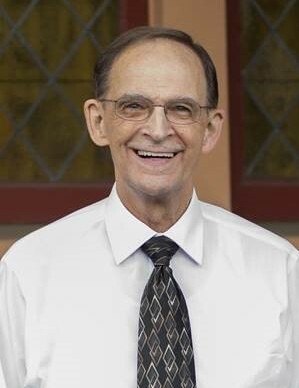 Reverend Jim Anderson, of California and formerly of Iowa Falls, Iowa, passed away Friday, September 28 at the John Muir Medical Center in Concord after a battle with congestive heart failure. A memorial service will be held in Iowa Falls, Iowa on Friday, October 12 at 11:00 A.M. at the First Baptist Church, 521 Rocksylvania Ave. Inurnment following at the Northlawn Memory Gardens Cemetery, with Military Honors provided by Hyman-Peavey American Legion Post #188 Iowa Falls. Linn’s Funeral Home in Iowa Falls is assisting the family with arrangements. James Christian Anderson was born in Iowa Falls, Iowa on October 28, 1943 to parents Evan and Mildred Anderson, and he and his six siblings grew up on the 600-acre farm his family owned and operated just outside town. setting that would feature prominently in his stories and sermons for the rest of his life. At nearby Owasa High School, Jim distinguished himself both athletically and academically. He was an all-state basketball player and graduated as class valedictorian. In 1968, he was drafted into the Army. He fought in the Vietnam War as a member of F Company, 75th Infantry, Airborne Rangers. His experiences there had a profound effect on him, and he treasured deeply his memories of the brave men with whom he served. He will be honored with a brick at the Ranger Memorial at Fort Benning, Georgia. Upon returning from Vietnam, Jim found the two things that would bring shape, purpose, and joy to the rest of his life: his wife Bonnie (Fiscus) and his calling as a preacher. After marrying Bonnie and graduating from Sioux Falls College and then seminary, he served for 17 years as pastor at First Baptist Church of Warrens, Wisconsin, and then 23 years at First Baptist Church of Martinez, California. In his 40 years of ministry, Jim touched thousands of lives. He loved God, and he loved people, and he loved helping people find their way. He gave selflessly of his time and energy to everyone. He loved jokes and making people laugh, and when he asked you about your life, you felt like the most important, most loved person in the world. Jim is survived by his wife, Bonnie; his daughter Paige Anderson (from a previous marriage); his daughter Sarah Metz and her husband Noah; his son Joel and his wife Jung Yun; his son Jeff and his wife Liz; and his three grandsons, Jeffrey Metz, Joel Metz, and Parker Anderson. He is also survived by his siblings, Delmarie Chaplin, Jeff Anderson, Joel Anderson, Bea Anderson, Rachel Bru, and Julie Anderson. He is preceded in death by his parents, Evan and Mildred Anderson. In lieu of flowers, contributions in Jim’s name can be made to his alma mater, Sioux Falls Seminary, 2100 South Summit Avenue, Sioux Falls, SD 57105.